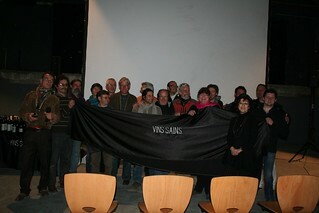 The inauguration of the new association Les Vins S.A.I.N.S. has been celebrated last saturday, April 21st in Montreuil/Paris with a presentation of the group of producers followed by a tasting of the wines to press and public. Les Vins S.A.I.N.S. stands for Les Vins Sans Intrant Ni Sulphites, or The Wines without products nor sulfites added. 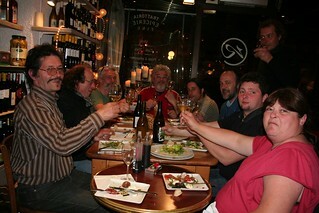 The idea to create a new association or gathering for wineries working entirely without chemistry added on their entire production, started through Giles Vergé and Jean-Pierre Robinot expressing their discontent in the evolution of the so called natural wines, becoming a little or non-defined summery of wines and wineries without a strict definition and thus confusing for consumers. Years ago, when in Italy the Vini Veri group split up, I was expressing my worries regarding the lack of definition which would result one day in big industry producing so called natural wines… Believe it or not, it has become reality with big negociant firms producing today special “selections”of no sulfur wines. Thinking about this phenomena, it seems that the wineworld is gradually changing towards a taste in the ’90 dominated by heavily oaked and elaborated wines towards a more elegant (and dangerous) style in today’s world. And if big industry is producing today selections of “natural wines”, this means that the market is growing for these wines. And inevitably a lot of fake wines and wineries will be ever more present on the market. Therefore, I joined immediately Jean-Pierre and Gilles as I feel it is the right time to clarify the definition of the “natural wines”. This entry was posted on Saturday, April 21st, 2012 at 9:44 pm	and is filed under Impressions & Experiences. You can follow any responses to this entry through the RSS 2.0 feed. Both comments and pings are currently closed.